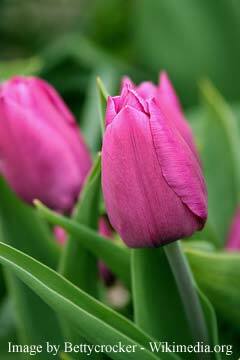 Tulip flowers are early bloomers and will get the color in your garden off to a beautiful start. The hardest part will be deciding which colors to go for: Midnight black or pristine white or bright pink - or how about those mottled ones! Comments: may need replacing if winters are severe. The variety in flower shapes and sizes make this a delightful plant to grow. This abundance in variety is also the reason tulips are a favorite for cutting beds. In a bed, tulip flowers are even more beautiful if you're able to plant them in clumps of at least ten of one variety. With the many types available, you may have these beauties blooming throughout the entire spring season in your garden. Kaufmanniana are first to bloom followed by Fosterianas then Triumphs and Hybrid Darwins and ending with the late blooming Lily and Parrot varieties. If you are buying loose tulip bulbs, remember that "big is best" and the bulb should feel heavy for its size. The bigger bulbs will probably be a bit more expensive yet will be well worth the price difference. During and after blooming season, it is a good idea to remove both flowers and foliage when they start to fade. Some gardeners prefer to grow top-quality blooms each year. These gardeners typically will dig up and discard the current season's bulbs. They will then replant new tulip bulbs each fall. Generally, if planted deeply enough according to plant tag directions, many tulips will winter over well in your garden. Note: If you want to leave them in the ground, purchase the bulbs marked "for naturalizing" and add a low-nitrogen fertilizer to the area in the fall. Do all tulips look alike? How do you know what to look for when buying tulip bulbs? Gardening bulbs and rhizomes...what's the difference?